heic1015a - Like brush strokes on a canvas, ridges of color seem to flow across this scene. But here, the canvas is nearly 3 light-years wide and the colors map emission from ionized gas in the Lagoon Nebula, recorded by the Hubble Space Telescope's Advanced Camera for Surveys. Also known as M8, the nebula is a star forming region about 5,000 light-years distant in the constellation Sagittarius. 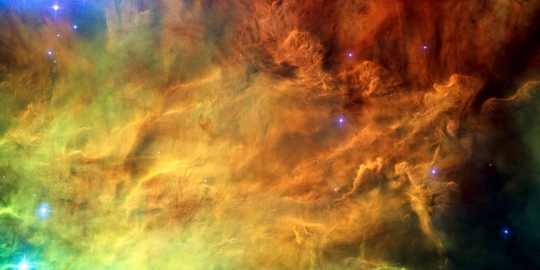 Hubble's remarkably sharp, close-up view reveals undulating shapes sculpted by the energetic light and winds from the region's new born stars. Of course, the Lagoon nebula is a popular target for earthbound skygazers, too. It features a prominent dust lane and bright hourglass shape in small telescopes with wider fields of view.